I live in TX and considering moving to Mason, OH pursuing a dream job offer. So far, everything I read about Mason is great, esp schools. 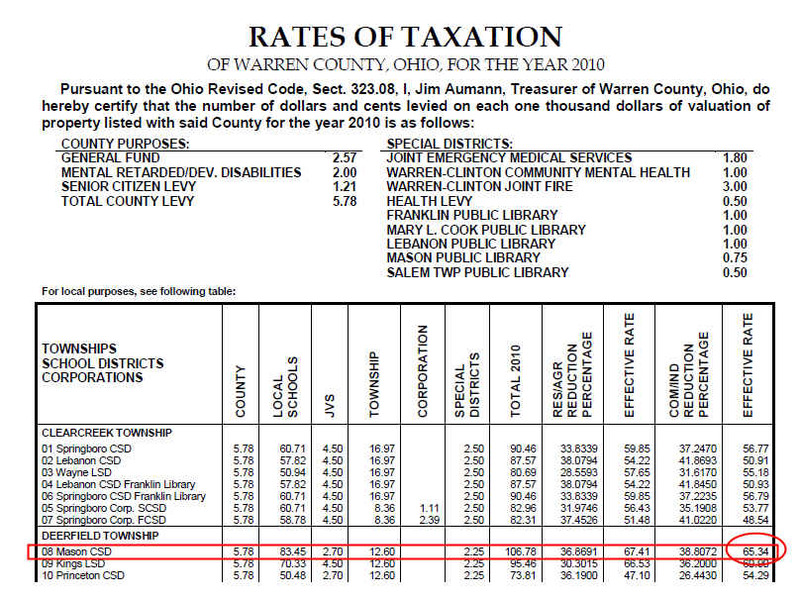 However, I looked up the property rates for Mason, OH here and if I am reading this right the rate is $65.34 for every $1000 of house value. In essence, I will be paying $16,335 for a $250,000 house?? No, the valuation percentage is 35% of true value so you take the 250k multiple by 35% and then apply the tax rate. So what is the actual tax value for a $250,000 house? $250,000 x .35 = 87,500. Tax = $5717.25. Cincinnati is no longer the housing bargain it was in the 1980s. Nearly $6000 for a 250K house? Whew ! Correct, its all about the taxes. Where does the money go? Failing schools, Medicaid? Thanks for the answer. I could do reverse engineering and figure out the percentage tax as 6.5%. Which in other words is 65.34 per $1000.